The lush tropical paradise of Honduras is a wonderful Central American country with a fascinating history. You’ll see evidence of its past wherever you go. Like many countries in the continent it was home to the Maya civilization until the 16th Century Spanish invasion. Some notable landmarks include the 17th Century Fortaleza Santa Barbara in Trujillo and the ancient Mayan ruins in Copán. Archaeologists have described Copán as the most ‘artistic’ of all Maya cities, so be sure to take a camera. The former capital, Comayagua contains a variety of elegant Spanish colonial buildings. The best time to visit is during the Easter week celebrations, when the locals showcase amazing sawdust artworks. You can delve further into the Honduran culture with a visit to the ‘Museum of National Identity’ in the capital, Tegucigalpa. Here you’ll find a large number of exhibits providing a comprehensive overview of the country’s history including its remarkable story of independence. Whilst in the capital, be sure to sample some of the local food from a street vendor or one of the increasing number of upmarket restaurants. Honduran cuisine draws influences from Spain, the Caribbean and Africa with the most popular ingredients being chicken, rice and coconut milk. 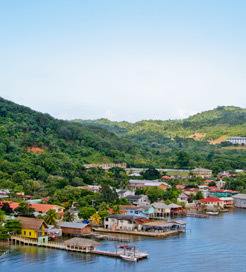 The Bay Islands, located between 25 and 50km from the north Honduran coast, are extremely popular with tourists with Roatán being the largest and most visited. It provides the best opportunity to dive in the second largest barrier reef in the world. The waters are teeming with sea turtles, coral and rays and the occasional whale shark. As well as the reef, Roatán boasts magnificent white beaches and lush forest areas, making it an ideal place to wind down after a day of sightseeing on the mainland. Travelling between La Ceiba and Roatán couldn’t be easier. There are 2 journeys a day with an average sailing time of 1 hour 20 minutes, giving you plenty of time to drink-in the stunning scenery. Safe Way Maritime operates this route, providing comfortable and well air-conditioned vessels with around 300 seats on board. For more information, please visit our Ferries from Roatan Island to Honduras page.